More than just dog food – the very best for your dog in harmony with nature and animal welfare. Without additives! A complete dog food. LUPO NATURAL is unique. 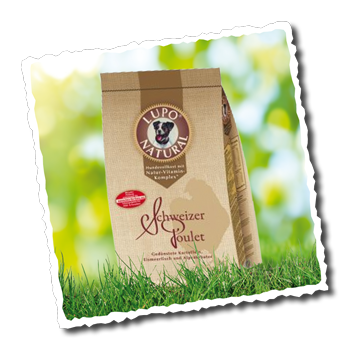 When you buy LUPO NATURAL you get much more than a premium complete dog food with the best ingredients. The highest quality of the contents and processing are a matter of course for us. Above and beyond that, we guarantee you that we only use chicken meat from Swiss farms which meet species-appropriate animal welfare standards. That means that as the Swiss animal welfare standards belong to the strictest in the world, you can be certain that the meat used is not sourced from mass animal farming or caged hens. And as a consequence of your decision to feed LUPO NATURAL a portion of the sale proceeds for each pack goes towards various animal welfare projects for wild and domesticated animals. LUPO NATURAL is animal welfare friendly; the meat is sourced from recognised animal-friendly farms in accordance with Swiss animal welfare standards.